About this time of year the leaves start to change... and I start to cringe. I'm not a typical lover of fall. Why? Well, it means winter is coming and I'm defnitely not into cold weather. Bah-hum bug! But this year I've decided to embrace fall... we've been enjoying pumpkin hunts, molasses cookies, butternut squash soup, the foliage. All kinds of fun things! After all, it is so beautiful! So today I'm sharing one of my latest finds with you. This pretty teacup and saucer is vibrant with a deeper pink and a little bit of fall coloring. Yesss - I saw this cup in your new finds post the other day - love it - love it! Interesting handle and great colors! Been thinking you might need to bring that along with you tomorrow . . .
Be in touch - should be a great Ren Faire day! Old Country Roses pattern? Thanks for sharing and Happy Pink Saturday weekend. If you can't beat it, join it, right? I'm right with you. Cold weather and I don't get along. But I do love all those wonderful treats and things you mentioned! Have a fun weekend! I do not mind the fall as much as I do winter. I cannot handle the cold. Love your little tea cup and saucer. Love the teacup and saucer. I am wishing for some cooler weather here in Florida.....can't wait!!! Actually had that tea cup set, sweetie. It truly is awesome. I had to pop over to see how you could fall further for pink! I now see the pun on "fall"! Happy autumn to you too! I'm glad you're enjoying all the treats and goodies that Fall has to offer. Love your pink roses tea cup and saucer. Bella~ very pretty.. obviously I am not much of a fall person either... I love my sun and sand... but like a small dose of th epretty changing colors.. enjoy your weekend! Fall is not for me too but I do like the fall colors/I love your cup and saucer. So pretty. 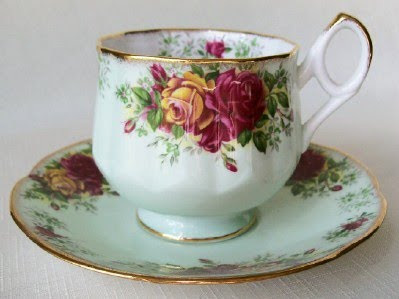 I have several like this shape ,most of them are Royal Albert and most vintage. Happy Pink weekend Jillian! I actually love Fall .. not sure why as it gets pretty cold here in the Winter. Love your new cup & saucer..
What a gorgeous view you haven, Jillian!!! Our trees are just turning yellows and/or browns and the leaves are dropping....not a lot of pretty reds and oranges this year...not enough rain during the summer. I can't believe YOU don't know about bittersweet!! It's a berry that grows on a vine. When it's picked, it soon "pops" open to look like a little flower. They are awesome entwined in fall decor. I just filled a huge old grapevine wreath with them and will put it out after HWEen...for Thanksgiving. If you google bittersweet berries images you'll see lots of great photos. I know you and Bebe are having great fall experiences!! Your teacup find is beautiful. You and me both kid...I am not a fall person. But this year, with all the fuss about fall in blogland, I am really getting in the mood. I usually by pass it and go straight to Winter and pray that Spring comes real soon. Your teacup really makes fall worth while. It is just beautiful.